Death and dying are often frightening concepts for adults, let alone for children. It is natural to have some fear of things unknown, and death is the ultimate doorway to the unknown. Parents can help to alleviate their children’s fears, however, by making themselves available for questions and providing honest, age appropriate answers. Sometimes, the diagnosis of a terminal illness forces parents to introduce their children to the concepts of dying and death before they would have hoped. Information varies, depending on a number of factors including the age of the child and the relationship that the child shares with the dying person. 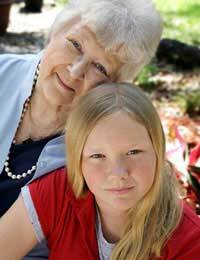 When someone close, such as a grandparent, is very ill, parents are wise to prepare their children for the possibility of death by discussing the illness, its likely effects on the grandparent, and the possibility that the grandparent may not survive. When dying hits even closer to home, as in the terminal illness of a parent, sibling, or even the child themselves, information should be doled out in small, manageable portions, allowing time for the child to process the information, ask questions, and express any emotions that they may have. Honesty is vital, but sensitivity is just as important. As they grow, children are able to more fully understand the concepts of dying and death. All children should be given accurate information, but they should only be told what they need to know or have expressed an interest in at the time. Providing kids with an inordinate amount of details can add to their confusion and increase their fear and anxiety. Young children should be told that someone has died (not “gone away” or has been “lost”) and that they will never be coming back. It is alright for parents to express their own sadness and they can explain to their children that they are upset because they will miss the deceased. Older kids and teens may ask questions regarding the afterlife, which parents will want to address based on their own belief systems. All children need to be assured that any emotions that they feel are alright and that expressing their feelings is not only appropriate, but encouraged. Young children often express worries about how a death will impact their lives. The loss of a parent, especially, can cause young children to fear how they will manage in their everyday lives. For example, they may worry about who will make their meals or tuck them in at night. It’s important to provide kids with answers to these questions, helping them to visualise their futures and know that they will continue to be taken care of. Older kids and teens are more able to understand the permanence of death, and may experience fear and anxiety over an impending or recent loss. Children who have recently lost a parent sometimes express fear that they will forget their deceased parent, so they consciously think about them a great deal, hoping to imbed their memory firmly in their minds. Providing assurance that treasured memories will stay with them can help, as can talking about shared memories and letting them know that they can talk about their feelings and share their worries any time that they feel the need. In children, grief doesn’t always manifest itself in ways that adults would expect. Some children may not cry when presented with news of a death, but will instead begin to act out. Older kids and teens may withdraw from parents, preferring to talk to their closest friends about their feelings. Parents should try to give their grieving children some space to grieve in their own ways, but may need to seek professional help if their children seem to have an especially hard time coping with their everyday lives. A certain amount of unorthodox behaviour is to be expected, but some children have a difficult time functioning after the death of a loved one. These kids may benefit from talking to a grief counselor or other mental health professional.